We’re just back from a week in Salzburg, Austria. One of the most beautiful cities we’ve ever visited. Also one of the cleanest. We were also taken by how many people, young & old, were wearing their national dress on the weekend. There was a palpable sense of pride in being from Salzburg. In being Austrian. Today I was in town early thanks to light traffic on a local holiday. So I parked up and went to Cafe Nero on Union Street. Walking down Chapel Street, I was disgusted to see rubbish strewn all over the street. Bins had been tipped over, but no-one was on hand to clean up. Moving onto Union Street and up towards Cafe Nero, I noticed how dirty the buildings and pavements were. The city seems resigned to it; no-one seems to care. When we first moved to Aberdeen over 7 years ago, it was a regular winner of Britain in Bloom. It looked lovely & welcoming. Now we can’t even cut the grass. Weeds replace once beautiful flowers. Rubbish lines the main roads. Budgets have been cut they tell us. No money to spare. And yet this is the oil capital of Europe. Sure, Salzburg is in the Alps, and is the home of Mozart, but I’d wager that Aberdeen generates more tax revenue. 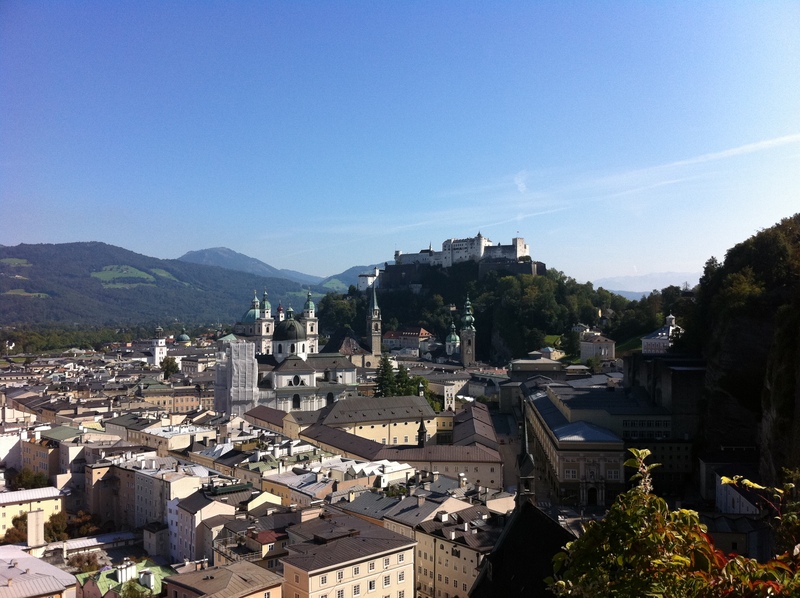 Salzburg manages to maintain several palaces and gardens and looks wonderful. We’re closing swimming pools and vital social enterprises. Where did it all go wrong & what does this tell us about the City’s priorities & values? Too much priority is given to entertaining the likes of Donald Trump and his golf course, and paying attention to Sir Ian Wood and his concreate everything that is green plans. Why not take Sir Wood’s promise of £50 Million investment and use it to tackle exactly the problems you have highlighted in this blog, run down looking streets etc. That and turning a wonderful building in the Marschial College that could have made an incredible museum, or attraction into a ego-centric council headquarters. It will cost more to demolish the ‘old’ concreate headquarters across the road, because of it’s position and the materials it is made out of than it did to revitalise Marschial College, at the expense of the tax payer. Priorities need to change. Aberdeen is a disproportionately expensive city to live in as it is, why not make it the best it can be. Good points buddy. Our priorities in this country are all wrong. We talked a lot about this in Austria. I would love to do something to change the system, but at the moment that would mean having to join a political party and they’re all as bad as each other! Not interested in petty squabbling & point scoring; more interested in positive change. Time for more #disruption! I agree with everything you have said. And with the previous comments. Though there are some little pockets of loveliness in the city. I took the kids to Seaton Park on Saturday – the garden area is just fabulous! But it’s still not enough – our run down streets should be clean, instead of strewing with litter!! I’ve never been there. I was running in Duthie Park the other night, and what used to be a lovely garden area is now over-grown with weeds. This was the park they proposed closing earlier this year to save money!?! I think I need to move abroad…..
Aberdeen is made for two types of people: Oil and Student. There is a revolving door system in both that does not reward the people who actually invest in the city. Alan, your suggestion of using Ian Wood’s £50 Million to improve the city in several areas has been mentioned several times. Unfortunately, that’s not what he wants, and the council are willing to bend over backwards to get their hands on the £50 Mill. The council have no idea how to handle money or how to spend it wisely (http://news.stv.tv/scotland/north/40937-aberdeen-council-fights-seagull-problem/) and seem to constantly find themselves in a endless pit of debt, even though the council before were able to save money. Alan, that’s a proper rant! Cheers Callum, again a lot of sense there. The problems are deep-rooted and will not be easily fixed. This is not just an Aberdeen problem though, Perth has similar issues – a once prosperous town in rapid decline. They all need to take a leaf out of Dundee’s book. It’s by no means perfect, but it re-invented itself ‘cos it had to. We lived there in the ’80s and it was on its’ knees. Someone had the foresight to invest in the arts and the city now has a cultural heart, with great facilities like the DCA. It will soon also host the V&A. Aberdeen needs to do something similar, but who’ll take up the challenge? Well it doesn’t help with the council SELLING St Nicholas House (http://www.eveningexpress.co.uk/Article.aspx/2450280) resulting in the possibility of Provost Skene House being over shadowed by an EMPTY building for the next few years. Not being a “local”, I don’t have a view on the details but certainly agree that something needs to be done. We’ll be moving back to Dundee soon & looking forward to it. The city’s changed so much (for the better!) since we left. I think there ia loads of potential in Aberdeen – but Dundee is a perfect example of where we could be. I took a Common Purpose group down to Dundee earlier this year and they all came back buzzing about how people can work together. There are pockets of people working well together to make the city a better place. Whatever you think about them, initiatives like the Business Improvement District, Retail Rocks and the redevelopment of Marischal College are folk at least doing something, rather than complaining and sticking with the status quo. We just need to foster this attitude a bit more – and talk ourselves up, instead of complaining in the P&J! I have a couple of ideas about some informal ‘getting things done’ sessions (much along the lines of meet140) – watch this space for more! I think the problems are two-fold. Firstly, the council place too much weight on the opinions of business leaders. I’m not anti-business by any means, but it’s a mistake that people in the public sector in particular can easily make. If someone has made a lot of money in business, it means that they’ve made a lot of money in business, it doesn’t mean that they have a better understanding of what people need, how cities should develop or anything else. Being ‘successful’ in business is easy to measure – made lots of money? – success! The problem is that being good at making lots of money doesn’t mean you’re good at improving cities, or inspiring people to take pride in their city, or anything. It was interesting to hear that the two most recent Aberdeen City Council chiefs had a “local businessleader” sitting on their interview panel. This might be good, or it might be bad. Why not have a local council service user? Or a small business owner? I think an effect of this is the abandonment of a strong plan for the city, on the promise of ‘prominent business leaders”. The second problem. A lack of pride, a lack of ownership and of any sense that the city belongs to the people and that the people belong to the city. I’ve lost the link, but there was an article on what makes a city appeal to its inhabitants, and right near the top of the list was having a sense of control over how the city is shaped. Aberdonians don’t feel they have any control over this. The city has developed without any thought as to te effect on the people, and communities within it. It’s not a new thing (St Machar Drive/School road happened in the 1920s, I believe, but the effect on the community of Old Aberdeen is still clear.– and it’s not unique to Aberdeen – look at the way the M8 splits Glasgow in two – (and I’m only using roads as examples here), but most cities have learned the lesson. Aberdeen hasn’t, which means that while almost everyone in the city agrees the place needs to change, people are divided on how to do it, because they worry the same mistakes will continue to be repeated. Aberdeen’s people are some of its greatest assets, but instead of working on ways to encourage positivity, and to get people to shape an idea they all want to be behind, instead a small number formulate a plan, and try to persuade us that everyone else likes it. We don’t listen to questions – we don’t think critically enough, and if we do ask the awkward questions, we’re dismissed as ‘negative naysayers’. I love this city, and would love to see investment in improving it, but it needs to be a strong plan, instead of any plan, and trying to spin it as something good.